Veneers offer a simple solution when you're concerned about small flaws in your teeth. Our Kissimmee and Hunters Creek, FL, dentist, Dr. Adel Mansour, cares for your smile and offers a variety of cosmetic dentistry treatments that will help you look your best. Veneers are designed to hide the little imperfections that occur on the fronts of your teeth. The restorations are crafted of translucent porcelain and are made to fit or enhance the shape of your teeth. Veneers are incredibly thin, yet offer excellent coverage for flaws. Before you receive your veneers, a small amount of enamel will be removed to ensure the optimum fit for your new restorations. You'll return to your Kissimmee and Hunters Creek dentists' office for your second appointment a week or two later. During the appointment, slight adjustments will be made to the veneers, then they'll be cemented to your teeth. Dentists use versatile veneers to hide many flaws and imperfections that appear on the front surfaces of your teeth. Are you self-conscious about a chipped tooth? Veneers conceal chips and other types of imperfections that affect tooth enamel, such as shallow cracks, pits, or bumps. A discolored tooth is noticeable the instant you smile. Unfortunately, brushing or whitening treatments have no effect if discoloration occurs due to tetracycline usage or certain dental problems or treatments. Your new veneer will be the same color as nearby teeth to ensure that your smile is finally uniform. Veneers are a good option if you want a whiter smile but don't want to whiten your teeth every few years. The restorations are available in any shade of white you prefer, allowing you to determine the ultimate level of whiteness for your smile. Veneers extend teeth, whether they're naturally short or have decreased in length due to a grinding or clenching habit. Pairing veneers with a nightguard can reduce the risk that you'll break your new veneers if you continue to grind or clench your teeth. 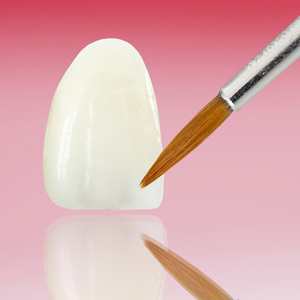 The restorations are also used to completely change the shape or length of a tooth. In fact, covered a crooked or oddly shaped tooth with a veneer is an easy way to transform your smile. Enhance your smile with veneers! Call our Kissimmee and Hunters Creek, FL, dentist, Dr. Mansour, at (407) 483-9990 to schedule your appointment.